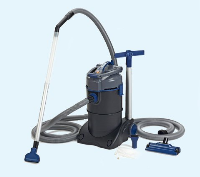 Vacuum non-stop thanks to the patented two-chamber system � simultaneous vacuuming and emptying of the tank. Maximum suction depth of 2.4 m thanks to high-performance 1800 W motor with optimised blade geometry. 4 robust, bend-resistant aluminum tubes. Transparent suction tube for flow-through control. Easy to move with transport rollers and adjustable handle. Delivered with special string algae nozzle, widened universal nozzle, area nozzle with rollers and integrated brush, wet vacuum brush, brush nozzle for corners and stubborn debris, debris collection bag for retention of coarse particles, 5 m suction hose and 2.5 m discharge hose.